Our room was on the main floor… we didn’t have to wait for the elevator; we just walked on down the hall. 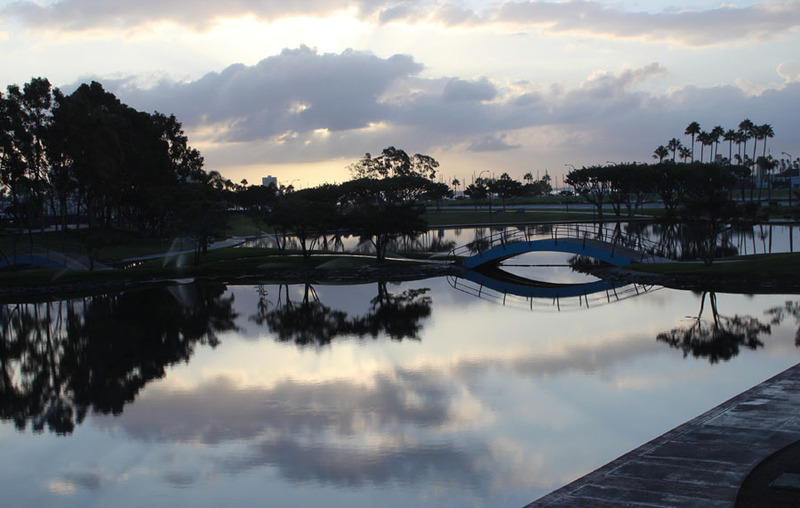 We enjoyed our view of the lagoon; watching the wind change the surface of the water and the reflections. It was still at the beginning of the day and then we were busy for the rest of the day! It was wonderful to get the call for more rugs! 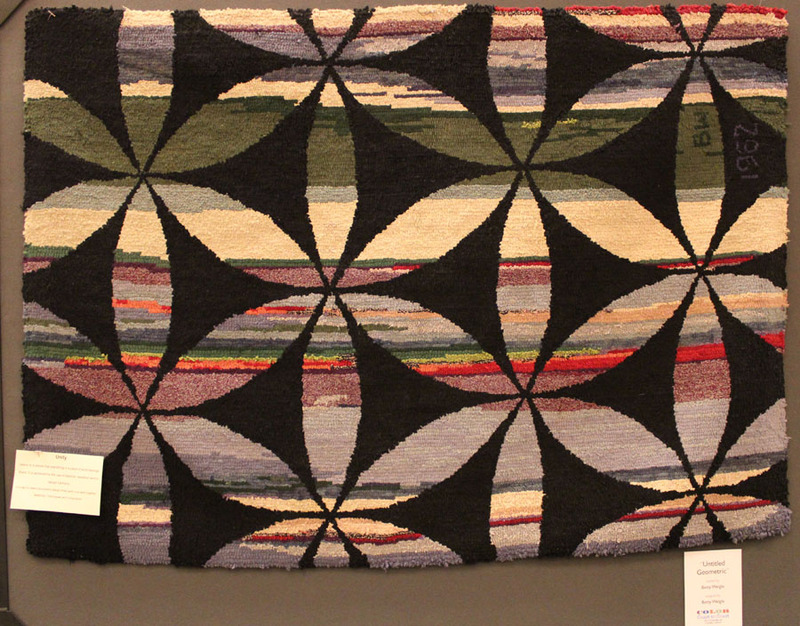 This lovely geometric is from Gene Shepherd’s mentor; Betty Weigle. I knew i could bring a few of my mother’s rugs… and surprise people. 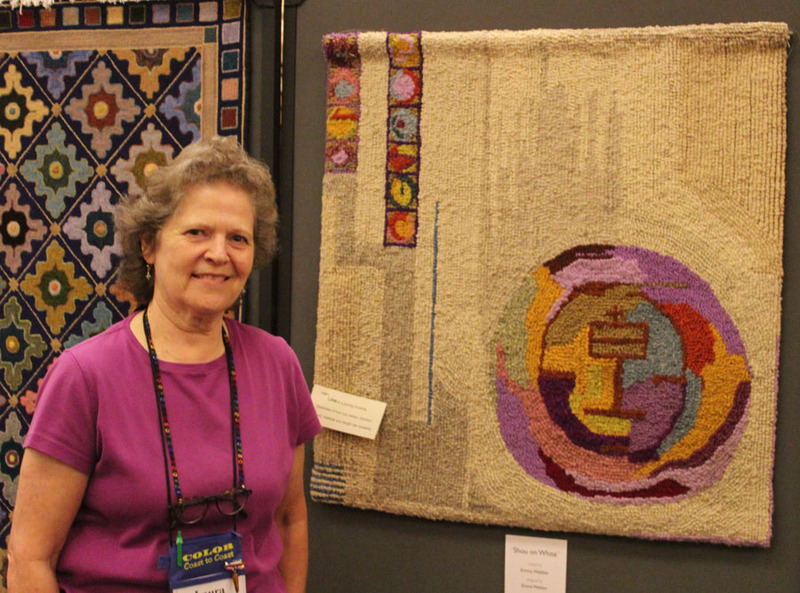 Jeanine Hillman & Nancy Bailey enjoy the Rug Show! We had several Wine Country Rug Hookers come down to Long Beach for the Biennial! 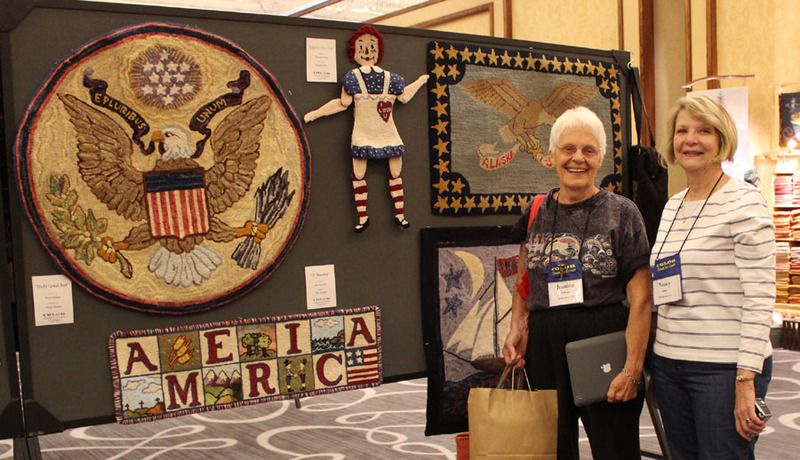 Here, Jeanine and Nancy were pausing to appreciate the patriotic rugs in red, white, blue and neutrals… especially the American Eagle! 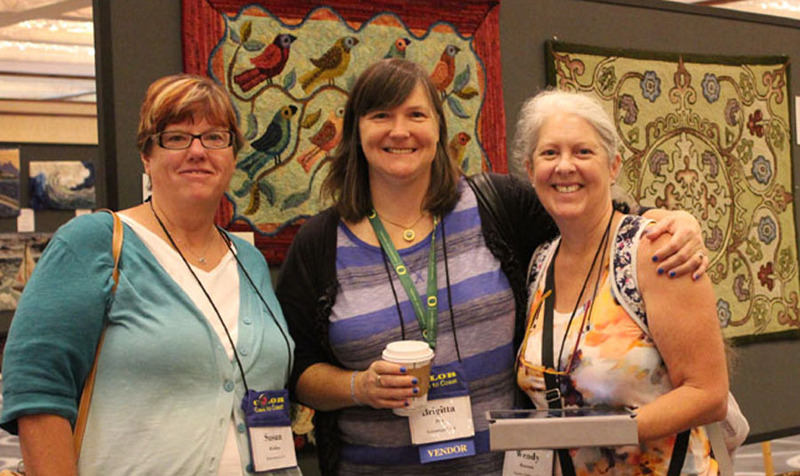 Brigitta, our WCRH President and the ATHA Secretary, is joined by friends, Susan and Wendy, in the Jane Olson section; we had many rugs for this tribute to Jane! Rug Hookers remembered Jane Olson by bringing their rugs of her design. We filled 9 panels with a few more on the floor. The exception is the little rug the Brigitta designed and hooked of the VW Bus that Jane drove to many rug camps and workshops before giving it to her grand-daughter, Brigitta! Other rugs from left to right: ‘Flowers’ hooked by Beryl Jenkins, ‘Farewell’ hooked by Pat Karasick, ‘Seasonal Mat’ hooked by Bonnie Applebee; all three designed by Jane Olson. thanks for commenting particularly on my landscape photo… love those cloudy sunny skies… and reflections double the fun! Beautiful photos! Looks like it was a wonderful gathering. Have heard so many good time comments. yes… it was big fun! guess you’ve heard form the Wool Poppies that were able to come to Long Beach. it was great to see all the rugs, meet up with friends, check out the vendors and attend classes. i’ve been attending workshops with Tanya Graham here is Sonoma County. next up is LRI rug camp… you know… more big fun!! then i’m looking forward to staying home and catching up. What a great snap shot of the Biennial’s events. I had a great view of the ferris wheel. Fun times.